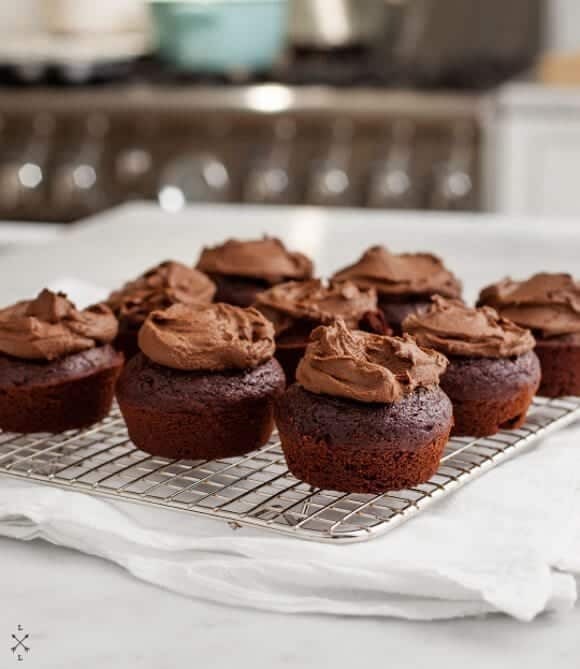 These vegan chocolate cupcakes are a healthier dessert. The avocado icing is so rich and yummy you'll want to eat it by the spoonful! It’s my birthday and I baked myself a cake. Actually, cupcakes… and technically I baked them last night so I could make this little b-day post today. I’m thirty-four today (ouch, that hurts to type). It’s the age that you start to forget what age you are… the age when you realize how silly you were when you felt old at 28. And it’s the age that you have to start taking really good notes because you just can’t keep “it all” in your head anymore. They say avocados and chocolate are brain foods right? (I don’t know who says, but it seems like something I might have read somewhere). I know it sounds weird and maybe a little gross to put them together but it actually works to make really thick and rich chocolatey frosting. But here’s a tip – don’t let your husband watch you put the green stuff into the blender. Of any recipe I’ve made, this was perhaps the one he was doubting the most. But, of course, he loved it in the end. Make the cupcakes: Mix the wet ingredients, mix the dry ingredients, mix together and bake for 15-18 minutes at 325 degrees. These are best if you under bake them slightly (since there's not very much oil in the recipe). Make the frosting: Melt the baking chocolate in the microwave (careful not to burn it). Let it cool slightly. In a food processor mix all ingredients together. Taste and adjust. Let chill in the fridge for at least 15 or so minutes. Happy day and happy year to you! My birthday is coming up this weekend, and I’m looking forward to a bit of celebrating myself. (: I’ve heard much of avocado in desserts and have probably tried a few, but I’ve not yet made anything myself. I ought to amend that soon! I’m super big into vegan cupcakes and desserts right now. 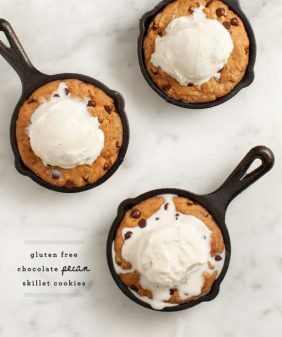 These look delish! Many happy returns Jeanine, I hope you have a wonderful day of celebrations. These cupcakes look like an admirable way to mark the occasion – I’m always on the look out for healthier frosting options too so I can’t wait to try this! Wishing you a truly wonderful birthday! I am excited to try the frosting out. I’m intrigued! Looks delicious! Happy birthday! The frosting looks great! Hi Mary Ann, sounds good, I think even pure maple would work here for the sweetness (since it’s the avocado that really creates the texture). Hope you try & like! Happy Birthday, Jeanine!! (From Alex and I!) Hope your birthday is wonderful! 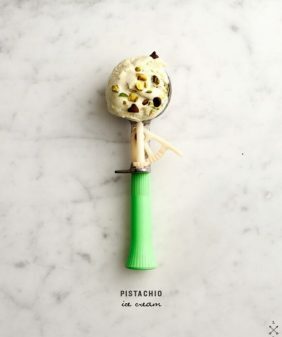 I love avocado frosting – I have been meaning to try it out in our kitchen, but hadn’t yet gone around to it. Looks wonderful 🙂 Have a special day! thanks Sonja! Hope you like it! I adore your blog! Hope you have a wonderful birthday! Happy Birthday Jeanine! I was just thinking about making cupcakes for MY 34th coming up in a few months. These are right up my alley. Thanks for the inspiration and the reminder (as I, too, have to write everything down these days). #1- Happpppy Birthday lovely!!! xo I hope you enjoyed your day and at least 5 cupcakes. #2 – I got overly excited when I saw chocolate cupcakes pop up on your blog. #3 – I adore chocolate avocado mousse and love the idea of sweetening it up a bit to use as frosting. Happy birthday! That is so funny, I am 28 and I thought I was 27 for an entire year. I am already losing track! I need this kinda brain food! Where can I find spelt flour? so weird, I did that from 27 to 28 too :). You can get spelt flour in the bulk bins at whole foods (or in the health food section of higher end grocery stores). But feel free to use all purpose or half whole wheat, I just happen to keep spelt on hand. Wishing you lots of happy moments, smiles and health! Happy birthday! Those cupcakes look lovely! I love love love these cupcakes. I used avocado before to make a raw chocolate ganache cake and it was the best chocolate cake I’ve ever eaten! These cupcakes are definitely on my to-do list! Happy Birthday! I love making my own cake, that way I get just what I want! Happy birthday Jeanine! I’m pretty sure I’ve consistently read (in an ambiguous way) that chocolate is TOTALLY the best brain food, so you’re completely on point with that. happy birthday, jeanine! the cupcakes look delicious! i definitely have to give the avocado a try next time i make frosting! I love avocado and chocolate together in savory dishes, like chicken mole… Love the idea of joining them in a sweet context. Wonder if there’s a way the avocado color and flavor could come through and play against the deep chocolate, without it seeming too weird, like sweet guacamole. And happy birthday! Yes, the notepad is critical. happy birthday – chocolate heaven! Happy birthday! I’ll turn 33 soon and I agree, you start to forget how old you are when you’re over 30 😉 I love that you added avocado to the frosting. And thank you for a tip, I’ll try to hide it from my hubby, hahaha. Happy Birthday! And these look delicious. I love chocolate-avocado mousse so I can only imagine I will like it on top of mini chocolate cakes. My birthday was just on the 5th!!! HAPPY BIRTHDAY!!!! My husband made “brookies,” those brownie/cookies…. yours look pretty good as well. And I turned the big 3-0, OUCH! 🙂 Yay for us. And PS, I can’t wait to try the frosting, I’ve made avocado ice cream and avocado cookies, but frosting??? BOOM! Happy birthday! Mine is next week….and I was looking for the perfect sweets! Looks delicious. Happy Birthday Jeanine! These cupcakes sound pretty delicious and that’s coming from someone who doesn’t like cake very much! I’ve made an avocado mousse before though, so maybe I’m just wanting to eat that part, ha! GOOD IDEA!! i love this idea of chocolate frosting made with avocados! i’ve made chocolate pudding with avocados and it was tasty! 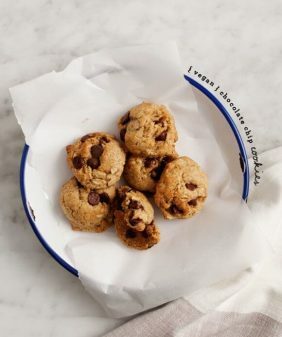 I made this recipe tonight with my own blend of gluten-free flour (1/2c rice flour, 1/4 tapioca flour, 1/4c potato starch per cup of all purpose flour called for) and it turned out AMAZING. So delicious. Thank you!!! so glad you liked it! (and so glad it worked as a gluten free version :). Thanks for sharing! A very Happy Birthday! Jeanine..
Can relate to your post.. Same pinch. 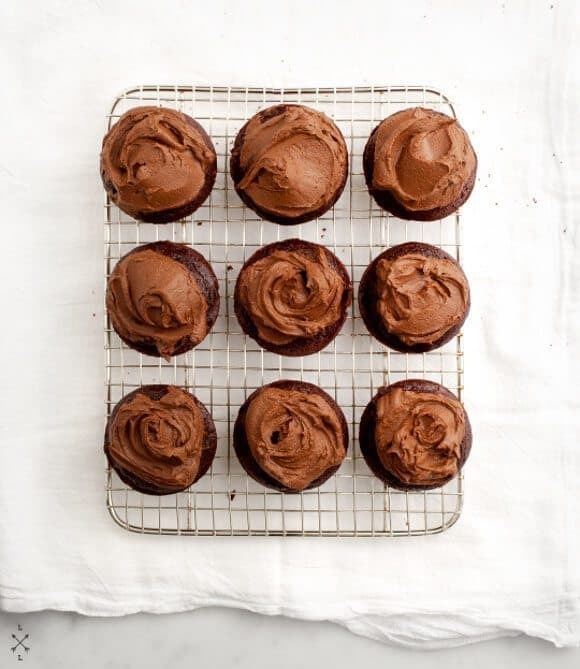 Avocado chocolate frosting sounds counter intuitive, but sure looks good! This looks wonderful. Thanks for sharing! Happy belated birthday! What do you find is the texture of the cupcake? And how do you feel the frosting golds up after the second day? Tomorrow is my friend’s birthday and I wanted to bake her a chocolate cake. What changes would you suggest for a cake? Thanks so much! i ended up making the cupcakes instead! they were a HUGE hit!! oh yay, I’m so glad! Hi Rebecca, you can bake the batter in an 8 or 9-inch round cake pan for 20-25 minutes. Wow! What an amazing recipe! I’ve just landed in your blog and these cupcakes are fabulous. I’m lactose intolerant so I love this kind of recipes. I baked these cupcakes and they were absolutely lovely! Thank you for sharing your recipe! Here they are, translated in portuguese! Thanks for sharing such an awesome recipe! This recipe looks delicious! 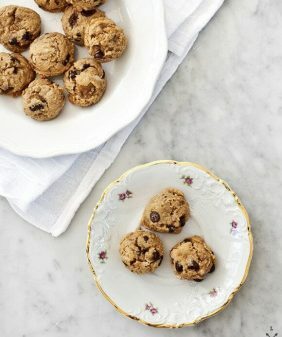 I’d love to try this recipe but I’m living abroad and can’t get my hands on agave or maple syrup. Can I substitute sugar or honey for the agave syrup? If so, how much? Thanks!!! Just replace with regular white sugar in equal amounts. They say agave is a little sweeter than regular sugar, but these cupcakes are slightly on the less-sweet side as it is, so I would just sub sugar in equally. If you mix the frosting, taste it, and would like it sweeter, then you can add more sugar to your liking. These Cupcakes were delicious. I served some of them to my non-vegan friends and they loved them! All natural, healthy, and fantastic! Hi! The recipe looks delicious and I can’t wait to try the icing! I’m concerned however about the use of agave, because I recently I read that even though it has a relatively low glycemic index, it’s highly processed and practically all fructose which is bad for us. Maple syrup is too expensive an option for me (agave isn’t cheap either). 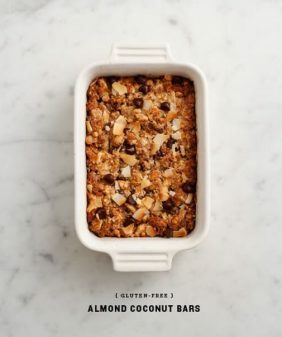 I am wondering if it would work with coconut sugar, and what adjustments you would suggest. I did find something interesting in an Asian market however – it’s called palm sugar (not coconut sugar) and is sold in a bag of little blobs from the sap of a type of palm tree not used for coconuts, without heating or processing. If anyone out there in cyberspace can either find it or order it, you just mix about 4 or 5 of the light golden blobs with a cup of water, and boil until they dissolve into a syrup thinner than agave (for the thicker syrup start with less water or more blobs. It thickens slightly when chilled). It is delicious, healthier and less expensive and a more environmentally sustainable alternative to agave/maple. Hi Phylis, I’m not sure but… let me know if you give it a try. Help! I just made these, but something went awfully wrong! The texture of the cupcakes and icing were perfect, but they taste…well, they just taste bad! I tried to figure out what went wrong and the only thing that comes to mind is the agave. Does it go rancid? Because the one I have has a really bitter chemical like taste and smell to it. It smells the same way my cupcakes and icing taste! Weird, right? I plan on trying these again, because I am convinced that something is bad wrong with the agave syrup I have. Is it possible to use honey? 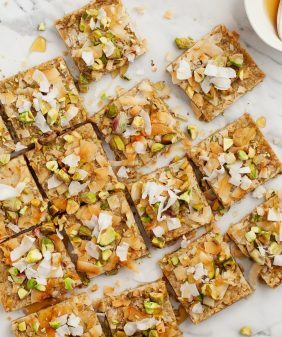 Would it be possible to substitute coconut milk for almond milk here? Hi Calley, I think it should work – I would use coconut milk from a carton that has a similar fat content as almond milk (ie, not a can of full fat coconut milk – it might make things too dense). How many cupcakes does this yield? I made these yesterday for my best friend’s birthday and they turned out SO good!!! I absolutely loved them and everyone else (non-vegans) as well even my dad complimented me on them and he’s super tricky to please! they were so yummy i ate 3 of them no shame though 🙂 also I substituded maple for agave which worked perfectly and used vegan cashew frosting since my family usually bakes chocolate cupcakes with plain frosting 🙂 paired very well though! also wanted to comment how they taste just like “normal” cupcakes and you cant tell they are a bit healthier than your average cupcake and vegan! I will definitely be making them in the future, a definite keeper sooo good!!! Thank you so much for your awesome recipes, I really adore your work! Hi Katie, yay, i’m so happy to hear that you and everyone enjoyed these!! Have you or any of your followers tried to make these into a cake? I’ve made these delicious cupcakes but would like to cook them in an 8×8 2 qt square glass dish. Advice? Hi Jacqui – I’ve made it in 8×8 and 9×9 round cake pans so I’m pretty sure it’ll work in an 8×8 square dish! I should have known your blog would come up when I was looking for healthy sugar free cupcake recipes! My five year old was diagnosed with a Type 1diabetes six weeks ago, 😞 and with school starting I’m imagining the birthday parties and class parties to come and panicking over the high carb treats rolling in. I want to make cupcakes for her to enjoy with everyone else’s. Can I bake a batch of these and freeze them? Also, I just can’t bring myself to use Splenda and the like so I was wondering if there was anyway to cut the agave down a bit or substitute a few dates in its place? Do you have a rough estimate how many carbs might be in this recipe? There’s so many healthy additions I’m sure I’m better off using yours! Thanks in advance, I know it’s a bunch of weird questions. Yes, the cupcakes, unfrosted, can be frozen. These are not very sweet, so I can’t say how much cutting back the agave would change them and I think dates will change the texture.